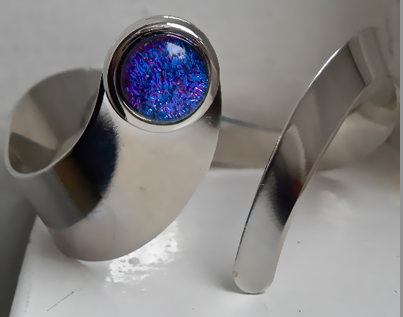 This bangle is 2cm at it's broadest and 0.5cm at it's narrowest part. It has an undulating snake like shape and can be worn on the wrist or further up the arm. The glass piece is 1.2cm in diameter and is made of two layers of glass. A base layer of Blue/Purple Dichroic glass topped with a layer of clear glass. The bangle is Rhodium plated which is very shiny, and it comes in a Silver card bangle gift box.